Today only, Home Depot takes up to 42% off a selection of hot tubs and a pool vacuum. Plus, these orders all receive free shipping. Amazon offers the Tide Concentrated Liquid Laundry Detergent 105-oz. Eco-Box in Original Scent for $19.94. Clip the $2 off coupon on the product page and order via Subscribe & Save to cut the price to $16.94. Plus, Prime members receive free shipping. That's tied with our mention from last month and about $3 less than you could expect to pay in local stores. Note: Be sure to cancel Subscribe & Save after your order ships to avoid being billed for subsequent shipments. It's easy to get overwhelmed by the alphabet soup of TV features. But once you learn a few terms and details, you'll be ready to pick up your perfect set. Additional contributions by Allison Martin. Buying a new TV is exciting, but it can also feel overwhelming. You can be bombarded with choices just by walking into your local Best Buy. And TV descriptions now are so long — what does 4K HDR LED UHD even mean? What makes a TV "smart"? Should you go with a curved TV or a flat screen? If all the TV options are stressing you out, we're here to help. Read on for the important TV terms you need to know, what they mean, and how to choose the best TV for your space. Many TVs on the market have 4K resolution, also called Ultra HD or UHD. But what does that mean? A 4K display will have 3,840 columns and 2,160 rows of pixels. For comparison, a 1080p TV has 1,920 columns and 1,080 rows of pixels. A 4K TV has four times as many pixels as a display with 1080p resolution. To get the most out of a 4K TV, it's best to view native 4K content. Native resolution means the file resolution and TV resolution are the same. In general, the higher pixel count of a 4K screen means images will look more natural, with smoother outlines and more detail. When it comes to 4K upscaling, you won't see more detail, but images should still look smoother than with native 1080p content. At that point, though, the differences are so small that whether or not it looks better will be subjective. To complicate matters further, now 8K has been introduced. It's 7,680 by 4,320 resolution and essentially gives you four times the pixels you'd have with 4K. However, it's still very pricey and probably not worth buying yet for most consumers. Content is just now really making the jump to 4K, although some movies are being filmed in 8K. Rtings notes this is for freedom in production rather than giving viewers the best-looking content. As it's still new, 8K resolution seems to be most beneficial with devices like virtual reality headsets and computer monitors. Basically, it's helpful when the user is up close and personal with the content rather than sitting about 8 feet away. We've covered smart TVs in-depth before, including the different platforms. They're ubiquitous now — it's probably easier at this point to find a smart set rather than a so-called "dumb" one. If you're shopping for a new TV, you should consider jumping into a smart ecosystem. However, if your budget is on the smaller side, you could look into streaming devices instead. A Roku streaming stick or Roku box will cost less than a brand-new TV, and if you already have subscriptions to Netflix, Hulu, and the like, opting for a streaming device over a smart TV won't make a huge difference in content viewing anyway. As for which is the best streaming device, that largely depends on personal preference. Amazon Fire TV devices, Roku, and Apple TV all have their own pros and cons, so do research before taking the plunge. And remember streaming devices can add to clutter around your TV. That means if you're short on space, it could be worth the investment to buy a smart set. What Are the Best TV Sizes? Unfortunately, there's no easy answer to what the best TV size is. It mostly depends on an individual's space and needs. Finding a cheap TV that measures 32" is easy, but will it fit into your space well, or should you opt for a bigger set? The bigger your set is, the more distance you'll need between your seating and the TV screen. Before deciding whether to stick with a midsize or big-screen set, it's important to take measurements. This includes measuring the height, width, and depth of the area where you want to put the TV. And don't forget to ensure your TV stand can support the set you're eyeing, if you don't plan on mounting it. You'll also want to determine the best distance for TV watching. Smaller sets will be better at shorter distances, and the bigger your set is, the more distance you'll need between your seating and the TV screen. Rtings has a helpful piece explaining the distance related to size, as well as a calculator to determine if your ideal set is a good fit for your space. These days, TVs come with plenty of confusing acronyms as part of their descriptions. Here are the most common ones you'll see and what they mean. LCD: True liquid crystal display TVs don't exist anymore, according to Digital Trends. They used to be manufactured with cold cathode fluorescent lamps for the backlight, but they're no longer made that way. Now LCD panels are used in the manufacturing of other sets. LED LCD: Sets with this notation have traditional LCD panels backlit by light-emitting diodes. More often than not, you'll see these referred to as LED TVs. OLED: Organic light-emitting diode displays don't use LCD panels. Rather, these sets can adjust the luminosity of each individual pixel. This means they can display pure blacks and you get an "infinite contrast ratio," which can lead to exceptional picture quality. QLED: This is just a marketing term devised by Samsung. The company uses it to describe its newer LED TVs, which are made with traditional LCD panels and LED backlights. However, between the LCD panel and the LED backlight, there's a nanoparticle filter that can produce more pure and saturated colors. SEE ALSO: Which Live TV Streaming Service Is Right for You? Each of these are suitable for different consumers. Those looking for the best colors available can spring for the QLED, and anyone who can afford OLED may be happier with the way it looks when compared to LED alone. But according to Rtings, OLED does have its drawbacks with slight image retention and changes in brightness. For most people, opting for an LED model is the best way to go. It tends to offer the best value and is found in a wide range of sizes to suit different spaces. TVs come with a variety of ports so you can connect all your favorite entertainment devices. Here are the ports and connectors you should consider when shopping for a new set. HDMI ports: They're used to stream audio and HD video. Many TVs come with HDMI 1.4 ports, but you'll want HDMI 2.0 ports for 4K TVs. For the latter, you can also confirm the port is HDCP (High-bandwidth Digital Content Protection) compatible. You'll want enough ports to accommodate gaming consoles, too. In essence, the more ports, the merrier. USB ports: You'll need these to access images of multimedia files from a thumb drive, or you can use them to power streaming devices such as the Google Chromecast or Roku Streaming Stick. A/V jacks: You can use these to connect a DVD player to your TV. Coaxial cables: You'll need these to connect cable boxes and antennas. Curved TV or Flat-Screen TV? A few years ago, curved TVs were touted as the next big thing. But these models never really grew in popularity and even now can be harder to find. Curved models are reportedly supposed to be better at immersing the viewer in their entertainment, as well as having better viewing angles. However, the differences between a flat and curved screen aren't necessarily worth the cost. The differences between curved and flat TVs are so minor that for most consumers, a flat screen is fine. Take viewing angles, for instance. 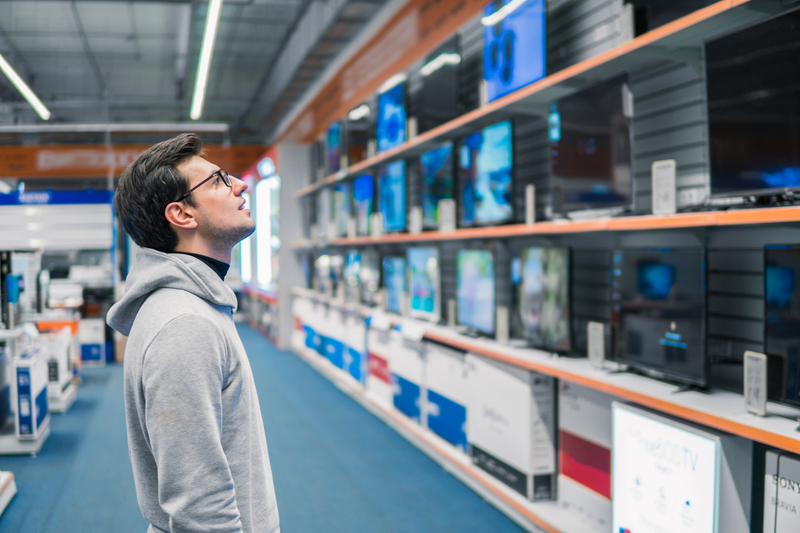 Up close, the sides of a flat screen will begin to darken, but as no one likely watches TV comfortably that way, it doesn't need to be an important factor when shopping. Additionally, when viewing from a 20-degree angle, both types of TVs begin to lose color accuracy. The results are very similar, so it's probably not worth springing for a pricey curved version. Finally, at more extreme angles like 45 degrees, you can get added dimension on the right side of a curved TV. But at this point the picture quality has deteriorated, and as Rtings says, if you're watching from an angle like that, your viewing experience is already subpar. The differences between curved and flat TVs are so minor that for most consumers, a flat screen is fine. If you have the money and enjoy the aesthetic of a curved set, it's fine to go for it. But again, for most people, a flat screen is all they need. Refresh rate is how many times per second a video screen is updated. Typically, the higher the refresh rate, the smoother and more natural-looking motion will be. Many older TVs have a rate of 60Hz, which means the picture refreshes 60 times per second. Newer models frequently have twice that rate, at 120Hz. Some models will be listed as having 240Hz or higher, but as CNET points out, that's usually "very carefully worded marketing fluff." As a general rule, it's better to opt for a higher rate than a lower one. In most cases, though, that should come down to choosing between 60Hz and 120Hz. HDR is another often-confusing term, thanks to the sheer variety of different names for it. We've covered HDR extensively before, but the short answer is high dynamic range is a common feature in modern TVs that expands the set's range of contrast, and also improves color accuracy. With the promise of a better picture, a 4K HDR TV might sound like the perfect way to go. HDR TVs are able to produce more light in certain areas of images. However, just because a TV can display that type of content doesn't mean it will do so well. With five standards for HDR, it might be hard to decide which one is best for your needs. The good news is HDR10, Dolby Vision, HLG, Advanced HDR, and HDR10+ aren't really competing with each other. This isn't the beginning of another format war; rather, each one is trying to accomplish something different and is largely cross-compatible with others. Readers, what do you look for when you shop for a TV? Let us know in the comments below.